Recently I was fortunate to be involved with a hunt that will forever be burned into my memory. During my 24 years of professional hunting I can say that this experience will move to the very top. Jimmy Brown, the guy that handles all of the bookings for Mellon Creek Outfitters informed us over a month ago that we would be doing a hunt with an Army Veteran whom had also been diagnosed with ALS (Amyotrophic Lateral Sclerosis). Normally, as things get closer Jimmy keeps us up to date on when people are arriving. Jimmy fell ill two weeks before the arrival of this group and was hospitalized. In fact, as I type this he is still in the hospital and has been diagnosed with Zollinger Ellison Syndrome. Chad Cooper who is Mellon Creek Outfitters taxidermist and Bill Carlson with Support U.S. Armed Forces http://www.supportusarmedforces.org had arranged the hunt. Between Chad and Bill, we were able to stay in contact with everyone and pick them up at the airport upon their arrival. Upon the Cogdill's arrival I could sense this was a very special family. Tony was in a wheelchair and surrounded by his family. His attitude in the face of such adversity was amazing. As he was pushed up to the baggage claim he smiled and was so excited about the coming hunt. His wife Alma, daughter, Victoria, and grandson, Taylor were all there supporting him. In just a few minutes we loaded up and headed to the ranch. Chad Cooper's son Zac has a TV Show called Little Man Big Dreams. Zac wanted Tony's hunt filmed for his DVD and TV show thus I was selected to film Tony's hunt. Tony's guide would be Trevor Umnus, so with those plans made we were all set. After a late lunch we were off to the range to make sure Tony's rifle was shooting straight. Apparently Tony's brother had been working with him on his shooting. He had a tri-pod built to hold his rifle, which was strapped down with Velcro because he cannot physically hold his gun. Since Tony has very limited mobility he told Trevor that someone would have to help him get his finger into the trigger guard as well as push the safety off. His gun had been somehow knocked off, as we had to adjust it seven inches in order for it to be shooting the way we wanted it to. I was amazed at how well Tony handled his rifle with such limitations. Within four shots we were ready to go as his rifle was almost touching holes on the target. On the first evening Trevor wanted to just drive around the ranch and show Tony deer. We helped Tony get into the truck and headed out to have a look around. For some reason this October has been unreasonably warm and for us the deer just weren't moving. On that two-hour drive we saw maybe 100 deer total with 30 to 45 being bucks. Tony was beside himself with excitement and Trevor and I felt a need to apologize for not seeing what we are capable of showing. Nevertheless, Tony and Bill were satisfied that there were more then enough deer to make this hunt a success. As the sun faded to the west we pulled back up to the lodge where Mellon Creek's chef had a great dinner almost ready. During dinner I couldn't get over how upbeat and positive everyone involved with this hunt was. Tony was full of laughter and his family was as well. It was remarkable to me how happy the setting was when it could have so easily been a setting of despair. 5:45AM we sat at the breakfast table with plans to leave by six. Due to a rain and warm temperatures we had some really bad mosquitos; so I left to go to the blind early to put out Thermacells. Trevor, Bill, and Tony arrived a few minutes after I had everything in place and we crawled into the blind. With Tony's rifle on a tripod as well as my tripod for my camera the blind was a bit cramped. It took a few minutes to get Tony set up but once we did you could almost feel the excitement in the dark. As the morning unfolded a few doe fed out into the area and a small buck. Around 8:30AM one of the bucks we were looking for stepped out and began feeding in our direction. With Tony's mobility issue we needed the buck to walk directly in line with the window in which Tony was facing. The buck stopped short of where we needed him to and disappeared into the brush. Hoping he would come out we waited two more hours but the buck never showed himself again. By this time the sun was turning the crowded blind into an oven so we called Bill to bring the truck and headed in for lunch. Back at the lodge a smiling and happy family met us. Alma, Victoria, and Taylor were excited to hear about the morning hunt. Tony sat at the dinner table in the lodge and gave his family a play by play of the morning's happenings. We would have lunch, rest and while, and return to the same blind that afternoon. We arrived at around 4:45PM and got things set up. Within an hour does and a small yearling buck began feeding out giving Tony something to watch. A good management buck walked out behind us and stayed there for well over an hour. We all were hoping he would feed around the other side of the blind but he never did. We watched two flocks of turkey and the doe for almost two hours waiting on that buck to move around us but he didn't. This buck finally walked straight away about two hundred yards and into the brush. Trevor decided that even though the rut wasn't happening he would try and rattle. Trevor told Tony that rattling probably wouldn't work but that we were running out of daylight and it wouldn't hurt anything. Trevor rattled his antlers together and within seconds a young six point came out of the brush in front of us. I pointed the buck out to Tony and Trevor told him that the buck was too young and too small to even consider taking. Something caught my eye behind us and the eight point management buck was walking our way. Trevor confirmed that it was the buck we had been waiting on. The angle the buck was walking would put him right where we needed him to be if he kept on this track. Our biggest fear was that his approach put him straight down wind of us. The buck got even and paused throwing his nose into the air. At this point I just knew it was over but strangely the buck kept coming. Given the fact that I was beside Tony he asked me to push his safety off. I did and the buck walked so close to the blind you could count the whiskers on his nose. He walked out to thirty yards exactly in line with Tony's rifle. Trevor grunted at him and he paused for just a split second. As the buck started to take a step Tony's rifle roared. Through the lens of the camera I could tell that it was a great hit. The buck ran and jumped a five-strand barbed wire fence giving a little concern that he was able to do that. My fear eased quickly as he didn't go twenty yards further and collapsed. The emotions began to build and there wasn't a dry eye in the blind. I found myself feeling like I had an entire soda can lumped in my throat. As I swung the camera to Tony's face to capture the pinnacle of the moment of excitement I could see the sun gleaming off of tears on Tony's cheeks. His smile was literally shinning throughout his entire body. As I held the lens on Tony's face I looked up at Trevor who was smiling with tears welling up in the corner of his eyes. Trevor was congratulating Tony while thank you and congratulations were bouncing off of every wall. It was all that I could do to find the strength to keep filming. I wanted to set my camera down and join in the excitement. Luckily, I didn't, as it was my responsibility to make certain this moment lives forever. Bill arrived with the truck and all of the congratulations started again. We arranged a chair for Tony to sit on, set the thermacells around him, and left Bill with him while Trevor and I retrieved the buck. 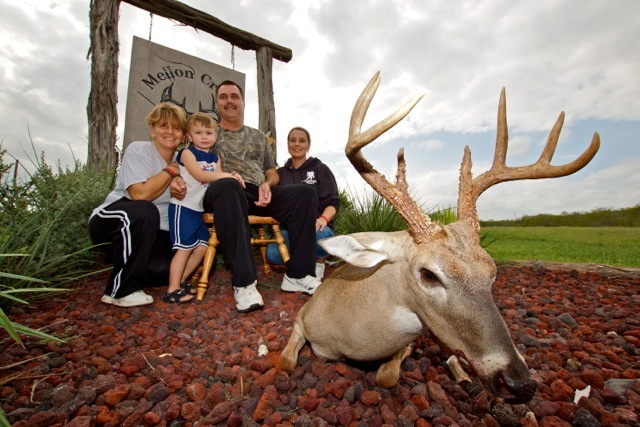 When we set the buck up for photographs in front of Tony the emotions ran rampant again. He is faced with a mountain of adversity of which few can even fathom; yet, he was so happy and so thankful. I sent a text message to the Chef to tell Alma and Victoria that Tony had taken his buck. Upon our arrival at the skinning shed Tony's family walked up to the truck excited and happy. Everyone was hugging Tony and talking about his buck. Alma told us that when they told Taylor about his grandfather getting a buck he started running around the lodge screaming," Papa got a buck, Papa, got a buck." We arranged a chair so that Tony could watch us measure his buck. He stayed until all of our jobs were done and then went to the lodge for lunch. Tony ended up getting a nice doe in the exact same stand but his boar was a hunt that I won't ever forget as well. Trevor had found where a big boar was coming in and set up a pop-up blind near. Well be fore daylight we moved into the blind and I set up beside it with the camera. Shortly after daylight the boar came in and turn right around and left. A few minutes went by and he came back. This boar was old and very cautious. He left again and came back a third time but stayed well hidden behind some brush. On his fourth return he walked just a little too far forward and Tony made an excellent shot. As I turned my camera to once again cause a moment to become immortal the excitement on Tony's face overwhelmed me. Tears of joy welled in Tony's eyes as Bill took photos and Trevor congratulated him. Tony was so excited and happy it would be impossible for me to describe it. He had never taken a boar before and this wasn't just any boar this one was really big. The camaraderie at the skinning shed once again convened into something unable to explain with words. Smiles from ear to ear came from every family member as well as the entire MCO staff. Tony sat and watched as I caped the boar for him. The thick hide in and around the boars shoulder intrigued everyone. Chad Cooper offered to do the Taxidermy free of charge for Tony which, to me, made everything even more sweet. Considering that I was filming this for a DVD as well as a TV show I needed to interview all involved. I walked out on the porch and asked Victoria if I could interview her. She informed me that she didn't like cameras and that she would be really nervous in this interview. However, once she sat down her interview went as if she had been doing it all of her life. In fact, everyone's interview did. I wasn't surprised to see that not one person completed their interview without at least a tear. This was a very emotional time. One thing for sure, this will never be forgotten. I have to say that from now on I will have a different look at myself as well as others when I hear them complain about things like cold weather, wind, rain, etc. I filmed a man with a mountain of adversity staring him in the face. For four days I saw nothing but determination, heart, happiness, and joy. Tony Cogdill set a very good and high example for me, his attitude is above and beyond anything I've ever seen. It was my pleasure to film this hunt and I can speak for each and every member of MCO's staff when I say THANK YOU to Tony and we hope the very best for him and his family. G5® Outdoors, the leading manufacturer of premium archery equipment and design, is revolutionizing the bow-shooting experience with the introduction of the Prime Rize. Rinehart R100 Heads to Wabash, Indiana. The highly regarded Bass & Bucks Archery Club is set to host R100 on August 1st and 2nd. Bozeman, MT - Sitka Gear, the industry leader in performance hunting gear has developed its most focused system ever for the hard-core rut hunter, by re-introducing the Fanatic Jacket and Bib and adding a Hoody and Lite Series to the Fanatic System.